My last painting, Coloring Eggs Together was so well received, and it definitely found a soft spot in my heart. It was suggested to me to not just leave it at that, but to paint a new interpretation of it. And thus, this sequel was made. As well as a miniature story to go along with it: Fredrick, George & Harry Bunny will hand you a card for their trade and it will most likely read the following: "...Bunny Bros. Inc., we'll paint your house, walls, fences, and storefronts. Have experience with whitewash, and fine detailed lettering." Their specialty however, has always lied with eggs (no job is too big or too small). They aim to please and take pride in their craft. During this particular project, the eldest Bunny Brother, Fredrick is consulting the plans to their tried and true architectural plans. They have enlisted the help of their two dear friends, Sadie & Sam. But painting eggs can be a messy business, and some sort of mischief always presents itself. The youngest, Harry Bunny, will definitely have to take a good long bath tonight to remove all of that red paint. WIP shot of a new illustration that I hope to share in a day or two. Inspired by a walk early this week I spied a little yellow flower peaking through the frosty ground. 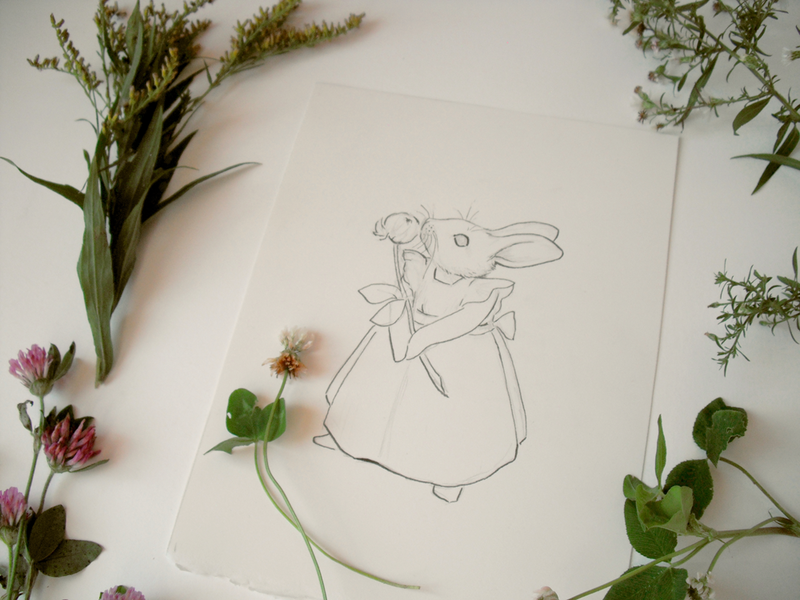 With it blossomed thoughts of spring and gardening, and a new sketch. This illustrator is now thinking thoughts of spring and looking for that first robin of the new year.